Last week came the news that a key organization behind the 2011 Quicken Loans Carrier Classic had settled on a new host on a new coast for 2012, scheduling a college basketball doubleheader (men’s and women’s) for the World War II-era carrier Yorktown, now a museum ship in South Carolina. West Coast hoops-on-a-carrier lovers had only a few hours to be disappointed. 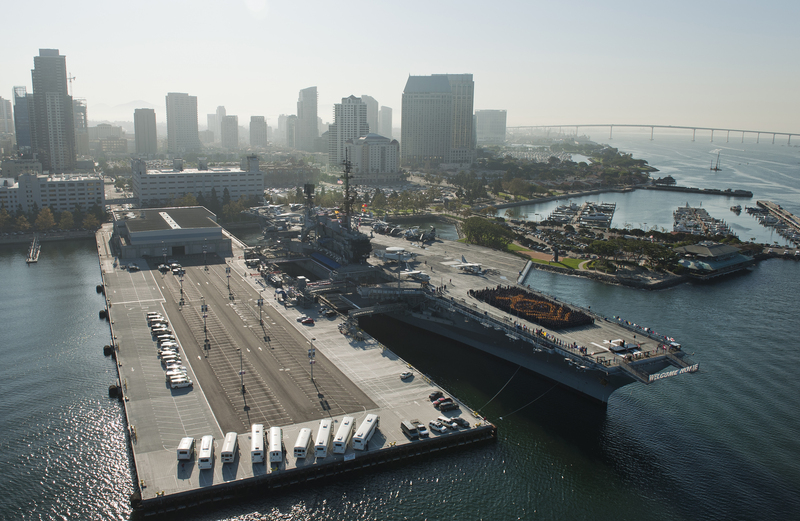 A few days after the (Charleston, S.C.) Post and Courier report cited last week, The San Diego Union-Tribune reported that the USS Midway Museum, in San Diego Bay, will host a Nov. 9 men’s game, likely between San Diego State and Georgetown. This game would be called “Battle on the Midway” and would be televised nationally, according to the report. Organizers with both events promised more information after the NCAA men’s tournament ends in early April: small items like confirmed participants, title sponsors, TV partners — that kind of thing. Those details will determine which, if either, of these events will be viewed as the true successor of last year’s inaugural game. Either way, the move from one game on a commissioned carrier to three games on two museum ships could make the proceedings a little less special.